Our Patient Navigation Program in Mexico was only launched a few months ago, but we are already seeing what an amazing service it provides for so many patients. Here, Dr. Enrique Soto tells the story of Juana in Mexico City. 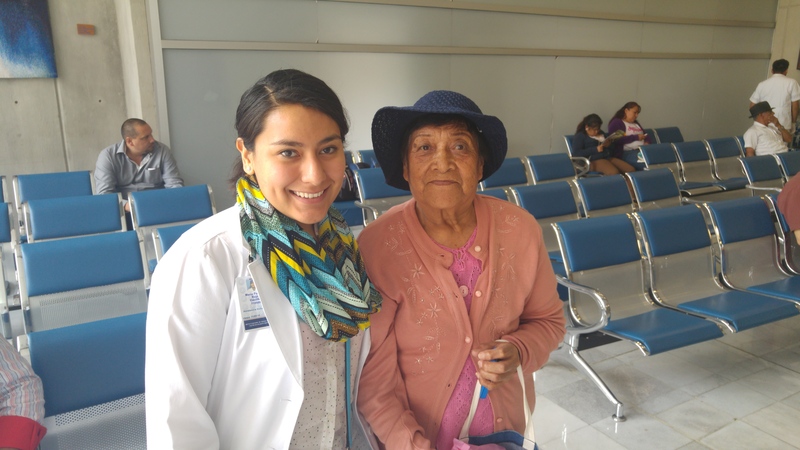 With the help of patient navigation, Juana has successfully navigated Mexico City’s health system and is now excited about the prospect of helping other patients like her complete chemotherapy! Ajusco Medio is the community hospital where Wendy, Mexico’s first navigator, works to navigate cancer patients to the proper cancer centers throughout the city for follow-up treatment and care. She not only helps schedule follow-up appointments and provides information on health insurance, but she also offers support and friendly face for patients who are trying to receive care within a complex and confusing health system. “In one of her follow-up visits, Juana was approached by Wendy, our patient navigator, who offered to help her receive adjuvant treatment with chemotherapy and radiotherapy. Juana started patient navigation and was navigated to the National Institute of Medical Science and Nutrition. There, she was seen by an oncologist within the first two weeks and enrolled in the Seguro Popular public health insurance system,” Dr. Soto explains. To be seen by an oncologist at a tertiary cancer center within two weeks of referral is an impressive feat in Mexico City, where the median time to arrive to a tertiary care center after being referred is two full months. With Wendy’s help, Juana was able to make this journey in a fraction of the time. Dr. Soto explains that Juana is a wonderful and energetic patient who is the perfect example of how navigation can help cancer patients move through a complex system to receive timely cancer care – with amazing results! Not only has Juana successfully started her cancer treatment, but she is now enrolled in public health insurance and is an active participant in other studies that aim to help patients just like her complete chemotherapy. Earlier this month, we launched our newest Patient Navigation Program in Montevideo, Uruguay. At Jardines del Hipodromo, a community health center in Uruguay’s capital city, two patient navigators are helping women with abnormal Pap tests receive the follow-up care they need. Pap tests are an important step in the early detection of cervical abnormalities and critical for the prevention of cervical cancer. Cervical cancer is one of the most common cancers affecting women in Uruguay and other low- and middle-income countries, and despite a comprehensive national prevention plan, the disease continues to impact the most vulnerable women in Uruguayan society – women in the public sector, young and single mothers, and those with lower educational levels and socioeconomic status. In order to detect and prevent the progression of cervical cancer, Pap tests are recommended for every women between 21 and 69 years of age. However, the proportion of women who receive a Pap test in Uruguay is low, and among those who do receive a Pap test, few know the results of their test or move on to receive the recommended follow-up care. The important thing to know about cervical cancer is that it is preventable – through screening, early detection, and timely follow-up, no woman should have to suffer from it. Yet women in Uruguay and other low- and middle-income countries are still presenting with cervical cancer at advanced stages and, as a result, are dying from a preventable disease. Patient navigation is one important and cost-effective way to enhance access to health care for underserved and vulnerable patients who suffer from – or are at great risk from suffering from – cancer. Patient navigators are specialized health care workers that operate at the intersection of social work, community outreach, and patient support, and they are important liaisons between patients and their health care teams. In Uruguay, our patient navigators are there to help women understand their Pap test results, know what they should do next, access existing health resources, and overcome barriers to receive the follow-up care they need. In this way, navigators are supporting women as they “navigate” the health system to access life-saving screening and treatment, thereby improving patient outcomes and cancer mortality. 1. Delivering test results: In a fragmented health system, sometimes just knowing your test results can be half of the battle for women receiving recommended Pap tests at their local health center. In Uruguay, there is a very important national plan to prevent cervical cancer, and the national program reads Pap tests from around the country to determine whether they are normal or not. Unfortunately, those results are not delivered back to the health center where the Pap test was performed. Even though women are supposed to receive a call from the national program with their results, the health center has no way of knowing which patients need follow-up care or if the women in their clinic are even receiving these calls. As part of the new Patient Navigation Program, navigators will personally call every women in the health center with an abnormal Pap result in the past two years to deliver the results. 2. Coordinating next steps: So your results have come back abnormal…now what? Once a woman learns of her Pap result from the navigator, the navigator will tell her what the recommended follow-up care is. The woman might need to come back for a repeat Pap, she may need a different test, or sometimes she will have to go to a specialty health care center for follow-up. The navigator will know this information and know how to help the woman get to where she needs to be – either by scheduling the follow-up appointment, informing her about clinic hours and days of services, or connecting her with a gynecologist to learn more about her options. 3. Overcoming barriers to care: Oftentimes, it isn’t enough to simply have a follow-up appointment scheduled. Patients are often faced with barriers that prevent them from showing up to their appointment or continuing to attend important follow-up appointments in the future. Work, family obligations, and childcare are some of the most common barriers that patients – especially women – face when trying to find time to go to the doctor. Other barriers may include lack of proper health insurance paperwork, difficulty reading or writing, language barriers, or lack of transportation to the clinic. The navigator is equipped to help with each of these issues – either by helping directly with the filing of paperwork for health insurance or patient registration, or connecting the patient to community resources for help with childcare or transportation. Sometimes something as simple as being able to purchase a discounted bus pass can help a women attend a lifesaving follow-up appointment. 4. Educating and empowering: In addition to all of the “logistical” barriers a patient could face, there are educational and psychological barriers that keep patients from attending appointments and making the most of their time with their doctor. Navigators also work to help patients understand what an abnormal Pap test means, as well as the importance of Pap tests, follow-up appointments, and both initiating and completing medical treatment. In this way, navigators can help empower patients to take an active role in seeking out healthcare, so women can continue positive health-seeking behaviors in this and other aspects of their health. By educating women about the importance of taking control of your health, the navigator can have a “ripple effect” in the community that isn’t limited just to the prevention of cervical cancer, but extends to other aspects of personal and family health. 5. Providing emotional support: Finally, a navigator provides emotional support throughout a woman’s journey to seek out her follow-up care. The anxiety that comes with an abnormal test result can be a barrier in and of itself, and many women feel shame or fear, which prevents them from addressing the issue early. They also worry about the impact on their families and jobs, and a navigator is there to connect women to support groups or simply provide emotional support by listening to and empathizing with them. Having an advocate dissipates some of the anxiety associated with coming to the health center to see a doctor, perform another test, or start treatment for a disease, and as a woman is shuttled around from doctor to doctor within a fragmented health system, a navigator can be a friendly face or an extra lifeline in a time of need. In these ways, patient navigators facilitate access to timely and quality care and help create a more positive healthcare experience, which lead to better health outcomes and greater patient empowerment. Our patient navigators are working to change the way follow-up care is provided to women in Montevideo, and their work will undoubtedly have a positive impact on the health center, the community, and the health system. Health system fragmentation is common in low- and middle-income countries. Most countries in Latin America have fragmented health systems with many different health coverage schemes – none of which are universal, and most of which exclude the poorest and most vulnerable patients. The result? A large proportion of patients who need care the most cannot access it, especially for complex chronic diseases like cancer. What is health system fragmentation? Health system fragmentation happens when there are many different health “subsystems” that coexist, providing care for different parts of a country’s population. Each of these subsystems has their own way of financing and delivering healthcare, and each provides healthcare to different types of people. For example, one subsystem will provide coverage for government workers, another will cover formally employed persons, and yet another will attempt to provide basic health benefits for the unemployed, etc. The problem is that when these subsystems operate independently from one another, they create major gaps in the provision of health services, often leaving out the poorest patients. Overall, fragmented health systems are less efficient, and provide fewer resources to those who need care the most, leading to great health inequities throughout a country. The issues arising from health system fragmentation are compounded by the fact that many health systems are not well funded by government spending in the first place, especially for chronic diseases like cancer. In fact, while Latin America spends an average of 7.7% of its GDP on cancer care, the U.S. spent nearly 18% of its GDP. Now imagine this small amount of money being used inefficiently and spread over a much larger population. Low- and middle-income countries represent 85% of the world’s population and 61% of new cancer cases globally, but they account for only 6% of global expenditures on cancer care. Fragmented health systems are very difficult for patients to navigate. Trying to move from a primary care center to a more specialized cancer center can be confusing, difficult, or even impossible if a patient doesn’t have proper insurance coverage. Because of this, fragmentation causes delays in diagnosis and initiating treatment, leading to late-stage disease and high mortality rates. Patients throughout Latin America have low screening rates, delayed referrals, and sometimes won’t even seek medical help because of these barriers. When health systems are fragmented (and not well-funded to begin with), they require high out-of-pocket expenses from patients at the hospital when they seek health care. Now imagine a family without health insurance, or even an inadequate public health insurance. If a member of that family is diagnosed with cancer, they would face health payments that would drive them into poverty – what we call “catastrophic out-of-pocket expenses.” In 2008, it was estimated that ⅓ of the people in Latin America were considered at high risk for such impoverishment due to catastrophic health expenditures. The WHO, in partnership with the World Bank, developed an agenda in 2015 to move towards universal health coverage (UHC) worldwide. It is clear that there are major gaps in the provisions of healthcare around the world: over 400 million people do not have access to one or more essential health services. Universal health coverage, in the form of national insurance schemes provided by governments, would not only ensure that basic health care is provided to everyone in that country, but would make the provision of health services more efficient and more equitable. Importantly, the move toward basic universalism is targeted towards the poorest sectors – the most vulnerable patients with the most barriers to care. Latin American countries have begun to move in this direction by creating special agencies to provide basic care for those who were previously uninsured. Due to this expansion of basic coverage, the proportion of people covered by insurance systems in Latin America grew from 46% to 60% between 2008 and 2013. The move toward universal health coverage will take time and will be more difficult for some countries than others. However, there are ways we can work within the broken systems that currently exist to help patients access the care they desperately need now. For example, through our Patient Navigation Programs, navigators facilitate patients’ passage through fragmented and complex health systems. They help underserved patients access health resources and overcome barriers they may encounter while trying to get cancer care, like making referral appointments and coordinating insurance paperwork. By providing patients with a knowledgeable resource and support system, navigators can help alleviate some of those systematic barriers to care that would usually stop patients in their tracks when trying to access the care they need.